Saad* was just a teenager when his younger brother was kidnapped by militias in southeastern Iraq. The militia sent pictures of the boy’s abuse to Saad’s family with a message: Leave the country immediately, or else. His family had no choice but to flee. Haben* also had to flee when a family member was killed by the Eritrean government. But she couldn’t bring all of her children with her; two of her young sons had been forced to join the military, where many are abused and tortured. She made the dangerous journey to cross the border into Ethiopia, leaving children behind in Eritrea – but it was a devastating choice. “How could I leave some children behind and bring the others with me? I felt very nervous and ashamed,” she said. These clients found CVT centers in Jordan and Ethiopia, but the vast majority of refugees and asylum seekers do not receive rehabilitative care after these traumatic experiences. 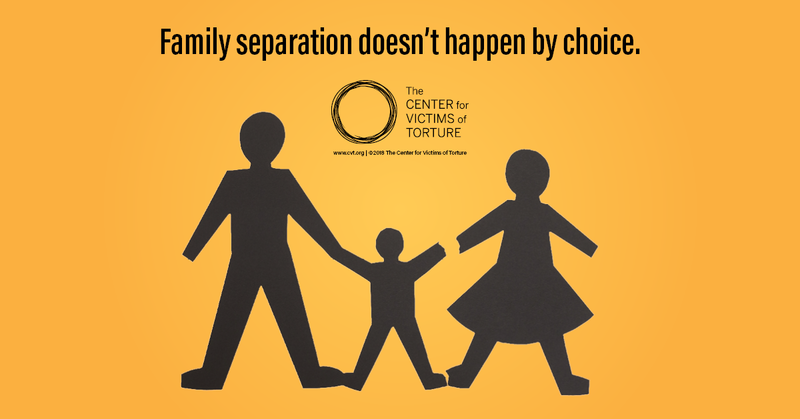 Forced separation, wherever it occurs, is an egregious human rights violation. Support us as we support survivors and advocate across the world to #KeepFamiliesTogether. *Names and some details have been changed for safety and to protect confidentiality.